Alex Russell lives in Davis and is at work on both stories and a novel. His work has appeared in the Georgetown Review, where he was a finalist in their annual magazine contest, and in the Atticus Review. 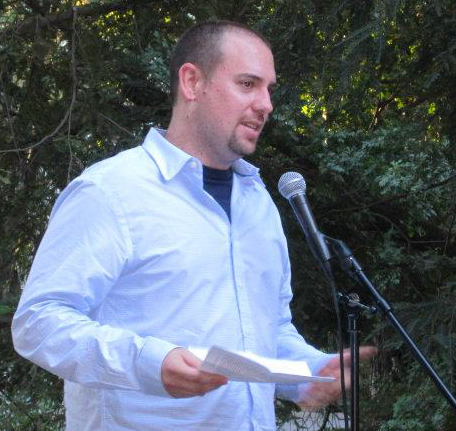 In 2012 he was also a finalist for the Tampa Review Danahy Prize. Alex graduated from the MA program in creative writing at UC Davis in 2012, the year following my graduation from the same program. Alex interviewed me for the January installment of Stories on Stage, and we thought it would be fitting to reverse roles for Alex’s Stories on Stage debut. Alex writes with sharp imagery that never gets in the way of the forward momentum of his stories. We sat down at Peet’s in Davis and talked about his novel-in-progress and his short story “Fire,” along with imagery, nostalgia, family, and future goals. Here are a few of the things Alex had to say. There’s a careful attention to detail in your writing that leads to stunning images. They lift the writing off the page and make it tangible and devastating. I was wondering if you could talk about your process with your imagery, if you have one, or how im ages work for you as you write? Images to me are the primary drivers of a story in a lot of ways. I don’t know if this method is a great thing to do as a storyteller, or if it’s native to storytelling, but I don’t usually start writing with a scene. My stories begin with an image. I believe in John Gardner’s advice about “The Waking Dream,” the idea that the writer should never put anything in that pulls the reader out of the dream state of reading. I’m also very visual anyway, as most people are, but images are the things that anchor me to a story. There is a pressing issue to put an image into words when I write. Recently, I started a relatively new process to approach starting the story “Fire.” I wrote a series of daily scenes, and this story grew out of a scene of a kid trying to light a fire in the fireplace and being unsuccessful at it. I picked this scene and asked questions of it. Another thing I’m very interested in is the way a metaphor shifts over narrative time, the way it takes on different meanings as a story changes. Sometimes the metaphors work and sometimes they don’t. I try not to assert too much control over images and metaphors, so they can grow naturally. If I stay out of their way, I can assert control and craft over other areas. I feel a strong sense of nostalgia in your writing, as though for the characters, the present isn’t living up to the past. I was wondering if you had any thoughts on how nostalgia works in your writing? Very transparently, one of my primary hang-ups just walking around is my nostalgia for the past. That’s my primary occupation. Talk about existential angst, that’s it. I try not to sweat on it too much, but the book I’m working on now is very much about the past and about the way the past holds sway over the present and prevents us from accessing the present, prevents us from accessing a more natural version of who we are as individuals because of the weight of having to carry all this stuff – trauma, hardship. We define ourselves in those ways when sometimes it’s just not true anymore. This manifests differently for everyone. I don’t understand how it works or why it’s that way. Similarly, families are having trouble relating in your writing. There’s an emphasis on the fact decisions have been made by the characters that can’t be undone, and the effects are far-reaching. This is important to your work in a thematic way. What is the role of family for you in these pieces? It’s a hobbling thing to write about families. What I’m writing about now has to do with what is noble about our pasts and our presents. Just because you were there for your past doesn’t mean you really know what it was or is. What I’m finding in the process of writing my novel is that heaping on details doesn’t bring us closer to understanding. I don’t think it has anything to do with volume of stuff. I think it’s something else. I know it sounds like I’m pursuing philosophical ideas but I’m really just chasing images. But it’s interesting to think about all this stuff. A lot of your characters are builders, men who work with their hands. This is an interesting contrast – building physical structures while other parts of their lives seem to crumble. Do you have any thoughts on the juxtaposition? Well, this could be kind of a shoddy metaphor if I let it get too simple. But I know the construction world. The house in my novel, I did the plumbing. It took me eight weeks. There’s a lot of metaphor in building. I’m interested in the more subtle metaphors too. I’m interested in the way the capitalist structure inflects that metaphor. This is serious money, not just guys getting together to build a house because they want to. At the same time I set my novel right at the cusp of the collapse, when guys were getting laid off. There’s this larger hand coming out of nowhere, there’s nothing that they can do about it. I’m interested in what happens to characters in that situation. It’s why I set it right at 2008. If you could pick out a few of the most important things you’ve learned about writing in the past few years, what would they be? What are your goals for the future? I think there’s an important transition that happens when you realize you’re no longer writing just personal writing, that your work should be bigger than personal writing. Because you could sit in a room and write all this stuff and make it almost like therapy. It’s one thing to write and try to achieve an emotional realness to something you’ve experienced personally – not necessarily even for a therapeutic purpose. But there’s a difference between that and writing that will get at something in the world that other people or you don’t understand yet. A perfect example that comes to my mind is George Saunders, who I think gets at the realities of the world that we all know but haven’t seen put in a certain, more visible way, while at the same time engaging us on a deeply emotional level. That’s what I aspire to, to pursue those types of issues that have huge sociological repercussions, repercussions in every way. That’s what I’m working toward – something larger that I don’t understand yet. Megan Cummins’s fiction has appeared in Freight Stories and Issue 17 of A Public Space. She attended the University of Michigan and the MA program in creative writing at UC Davis. She is a past contributor to Stories on Stage.